The 60 and 40 footers really showed what they were made of in the bay of Douarnenez in NW France today, such is their presence as they power along. Two starts were given this morning with remarkable precision on the part of the race committee headed by Loïc Ponceau: 1038 hours on the dot for the Class 40s and 1108 hours for the 60 footers, in exactly the same manner as yesterday. In contrast though, today’s weather conditions were very different, with 15 knots of N’ly wind and clear blue skies. 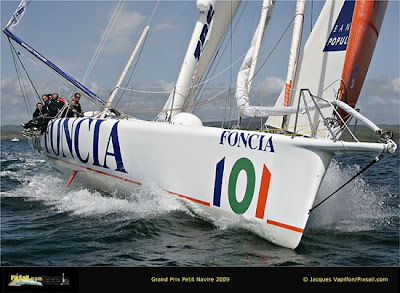 The monohulls quickly devoured the 47 miles of the course which took them as far as the Tas de Pois and ultimately line honours at 1517 hours went to BT. As such the British contingent stood out, with Artemis getting off to the best start. 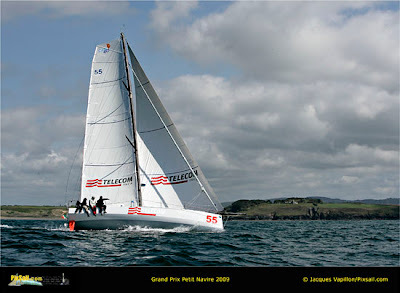 Meantime Le Pal was the first out of the starting blocks in the 40 foot category and the self same Bruno Jourdren and his crew of Bernard Stamm and Kito De Pavant also led proceedings yesterday, even beating in two 60 footers, DCNS and Artemis. Today there was a bit of a frosty reception on Jourdren’s boat as the crew were forced to retire for technical issues, which nobody onboard wished to comment on. In substance, Nono (Jourdren) did admit that they could have continued but not without risk of damaging the boat, “a bit like when you have tooth decay and you don’t get it seen to so you end up with a stomach ulcer”. In short, this retirement gave Giovanni Soldini outright victory today. “It’s to thank him (Soldini), because he’s come a long way to come and sail on our waters”. 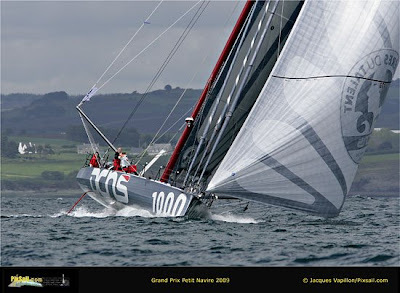 For the Class 40, the Grand Prix Petit Navire is a gathering which completely corresponds with the mindset of the sailors in this series: a clever mix of sport and conviviality. So much so that the Class, which has seen a spectacular rise since 2006, is opening itself up ever more on an international level and gathers together both experienced amateurs and professional sailors. “They are boats which are easy to power up and incredibly entertaining on the water” explains Bernard Stamm, skipper of a 60 footer. “It’s rather nice to be invited to sail on a Class 40”.